A few days back I mentioned that Arktiles Bump was one of my favorite minor figures from Jewell County history, because I know him in a way that I can't know most of the others. Bump wrote letters to his sister Margaret, and since he was writing to a close member of his family circle, he let his guard down and spoke his mind. He had nothing to say about politics or the recent war. It’s all really trivial stuff, the fact that his niece Emeline has gotten “as big and stout as an ox,” that he has stepmother issues and would really love to “go back and give her a good booting.” We learn that the Rock Island Station at Chillicothe, Illinois, may have been sixteen miles from his father’s house at Princeville, but Ark much preferred to walk through deep mud than pay the livery stable eight dollars to carry him. He managed to trudge eight miles before dark, and did the remaining eight in the morning. When I first encountered Mr. Bump, he was just a man who happened to be sitting on the wrong side of a wagon in the summer of 1867 when a shotgun went off. Now that I’ve read the letters, he’s not only a real human being, he’s a genuine character, and knowing some of his ailments and opinions and eccentricities, I can’t say his name without cracking a smile. 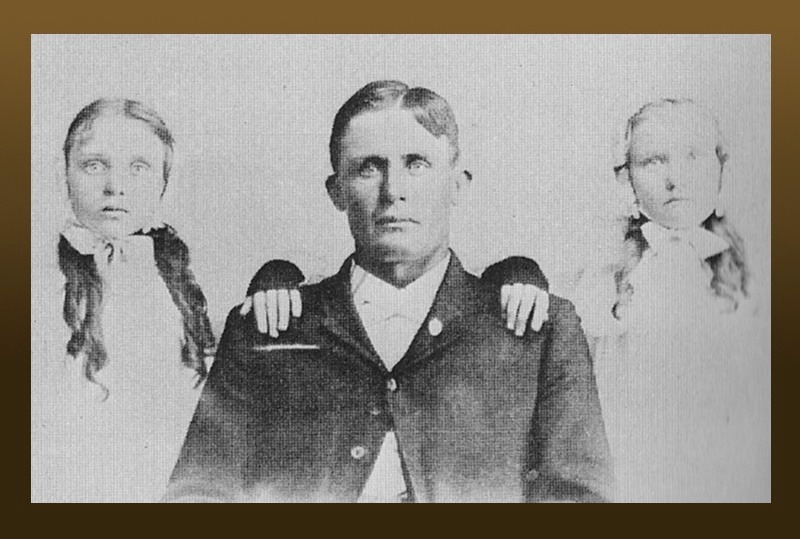 In a similar vein, there is a picture of Thomas Lovewell’s son Simpson Grant posing with his daughters that always struck me as rather spooky, in a maudlin Victorian way, like something that should be glimpsed hanging on the wall of a haunted English mansion in a Hammer horror film. Then, just as it comes into frame, there’s a flash of lightning and everyone in the theater jumps. Well, no more of that, now that I’ve received an email with what Dave Lovewell calls “useless trivia” about his grand-uncle. I barely remember him. I went with my grandfather Stephen to visit him when he was on his deathbed. I was probably 5 0r 6 years old. He gave me a flashlight. I was impressed. It had no batteries or bulb but I was impressed just the same. He was dead within a few days and I was dragged to the funeral. I was not impressed. My mother Mary told me several times that he was a balance freak. If he and Cora were in the car she had to sit in the right rear seat -- to keep it balanced. If there were 6 towels on the clothesline there had to be 3 on each end of the line, etc. Cora was locally famous for her angel food cakes. She would often comment on how many hundred she had baked and Grant would mutter, “Yes and I had to separate the egg whites from 13 eggs for every blinken-blanken one of them.” I dunno if it was the job he disliked or the uneven number of eggs. I have often wondered if it would have been ok with 14 eggs.. It was not the first time I had heard about the pride Cora took in making hundreds of angel food cakes from scratch, but the added details in Dave’s story made me laugh so hard that my wife came over to see what was funny, and she laughed, too. The next morning I remembered that picture, which I now see in a new light, and I started chuckling all over again. Another helping of useless trivia, please.